Within the frame of the Materials Networking Project, funded from the EU Horizon 2020 programme, from 17th to 20th of July, 2018, the Faculty of Chemistry and Pharmacy was visited by worldwide known researchers from the Department of Materials Science & Metallurgy, University of Cambridge, UK. 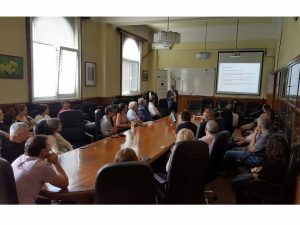 Prof. Lindsey Greer, Head of Physical Sciences Division of the University and Member of the Energy@Cambridge Strategic Advisory Board, visited the Faculty on 20th of July and presented a talk entitled “Extending the applicability of the glassy state”. During his visit, Prof. Greer had a meeting with the Vice Rector of University of Sofia Assoc. Prof. Eliza Stefanova and discussed topics of mutual interest connected with cooperation between the two universities in education and science. 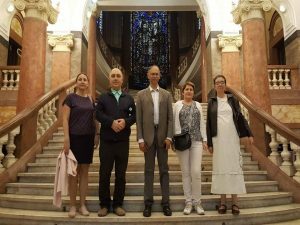 Prof. Vasant Kumar and Dr. Rumen Tomov visited the Faculty from 18th to 19th of July, 2018. Prof. Kumar presented a lecture entitled “Sustainability of Materials in the Evolving Energy-Environment Paradigm”. 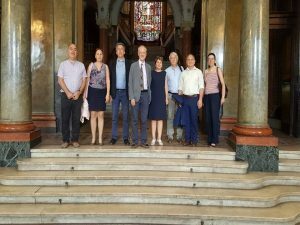 During their visit the scientists from University of Cambridge had a meeting with the Dean of the Faculty of Chemistry and Pharmacy, Sofia University as well as they had discussions on joint research topics and collaborations with scientists from the Faculty of Chemistry and Pharmacy.